Juno is set to uncover what Jupiter has been hiding. After a five-year, 1.75-billion-mile voyage, NASA's spacecraft named after a Roman goddess successfully entered into orbit around the largest planet in our solar system Monday night. But for the space agency, getting to Jupiter was not the most nail-biting part of the journey. The planet's intense radiation and gravitational pull threatened to end the mission before the craft even began its work. 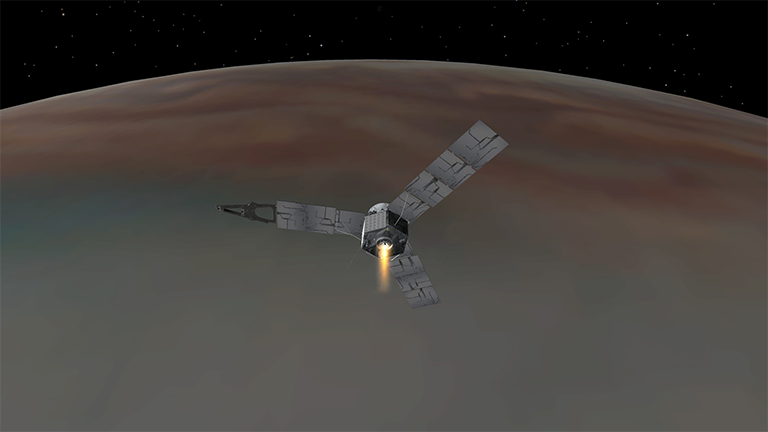 However, shortly before midnight Monday night, NASA scientists got the confirmation for which they were holding their collective breath: Juno's 35-minute engine burn worked as hoped and set the craft into orbit around Jupiter. Over the next 20 months, the basketball court-sized spacecraft will travel around the planet 37 times in egg-shaped orbits, each lasting 14 days. It will be the first spacecraft to peer beneath Jupiter's dense surface atmosphere to see what lies beneath. Below, watch a time-lapse video of the Galilean satellites in motion around Jupiter captured by NASA’s Juno spacecraft. The planetarium's monthly event Adler After Dark features a Jupiter theme in July, with hands-on programs exploring Jupiter's storm systems, magnetic fields and family of moons, plus live music from Rosie and the Rivets. The event takes place from 6:30-11 p.m. Thursday, July 21 and is limited to ages 21 and up; tickets are available online. June 20: Monday marks a rare celestial event for stargazers: For the first time in decades, the full moon falls on the summer solstice. Feb. 4: Scientists at the University of Chicago are hoping a new, highly sensitive camera they're developing for the South Pole Telescope will reveal new information about the early universe. Jan. 25: For the first time in a decade, five planets will be visible at the same time in the pre-dawn sky – and you won't need a telescope to see them. Sept. 28, 2015: Last week NASA said it would be making a major announcement today about a discovery on Mars. While some space fans might have been hoping it was about finding life, the announcement was about something almost as significant. Sept. 25, 2015: Weather permitting, the Chicago area will be treated to prime time, front-row seats for a rare astronomical phenomenon Sunday evening when a total lunar eclipse of a simultaneous harvest moon, supermoon and blood moon rises above the horizon.